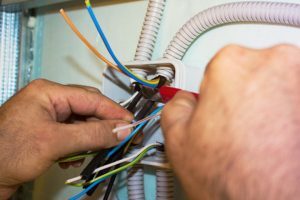 Finding the top Duluth, Georgia electricians for your residential or commercial electrical jobs just got easier. Through Bryan Electric, Inc., residents of Duluth have access to a variety of expert electrical services and repairs. These range from interior work to exterior modifications. Let our electrical service professionals examine your issues and come up with efficient, cost-effective solutions using advanced technology. We can get your electrical system back on track quickly, while also helping you prevent future malfunctions with regular maintenance. We serve our customers using the latest equipment, including inspections that utilize infrared thermal imaging technology. Our use of this technology can help your system work at full capacity for longer. We detect issues before they can have an adverse impact on your electrical service, stopping them in their tracks. At Bryan Electric, Inc., we also provide energy audits to identify the ways you waste energy. In this way, we can help you cut down on your utility bills without losing any of the comforts you deserve. We offer Duluth residents quick response times and 24-hour service. This means you can get the help you require without the annoyance of a long wait. Our electrical experts will bring effective, reliable solutions for your issues. In addition, In addition, you’ll find out what our rates are ahead of time, and we’ll give you a precise timeframe for when your technician will arrive. Our emergency service professionals will keep you out of the dark, with fast response times and the training to repair your system quickly and without charging you an arm and a leg. At Bryan Electric, your convenience is always one of our top priorities. Although our electricians do emergency repairs, that isn’t all we bring to our customers. We can prevent the need for future repairs by looking over your electrical system and identifying where it needs replacements and modifications. Your system will keep running efficiently and smoothly, and we’ll even help you decide on the right equipment to suit your needs. So, whether it’s choosing a new generator or upgrading an electrical panel, we can guide you and help you avoid issues down the line. Want more information about our expert electricians? Give us a call at (770) 680-2144 to get in touch today. One of the top electricians in Atlanta. Very reasonable pricing, reliable and friendly service. We highly recommend Bryan Electric!